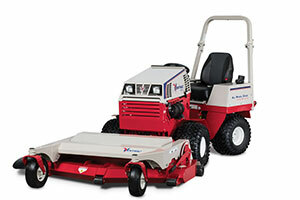 Ventrac, a manufacturer of compact tractors and attachments, unveiled its new lineup of finish mower decks. This new series of mowers—which includes the MS720, MT720, MS600 and MU720 models—is compatible with the Ventrac 4500 tractors. These models come in widths from 60 inches to 72 inches, with options for side and rear discharge, along with an offset version. Features include a deeper shell, a rubber discharge chute and multiple anti-scalp rollers. Strengthened rear roller mounts also help support the weight of the deck, while a larger rear striping roller increases bearing life and creates more pronounced stripes, the company said. One option for the decks is the new hydraulic flip-up kit. With this kit installed, you can flip the mower deck up by using the company’s SDLA operator controls. The one-lever height adjustment allows users to set a range of cutting heights in 1/4-inch increments. The model MT720 deck is offset six inches to the left making it optimal for trimming around obstacles like fence rows, low-hanging trees and water landscape, Ventrac said. All the side discharge decks come standard with high- and low-lift blades. Mulching and gator blades are also available to fit customer’s needs. Other options for these new decks include flat-free tires, a mulching kit and collection boots for use with the Ventrac vacuum collection system.